Juliana is currently exhibiting at Wall Projects II, Montrose, Angus as part of EMPIRE,a SSA members’ exhibition curated by Gayle Nelson PSSA and Alan Bond SSA. The gallery is based in the former premises of the Montrose Rope & Sail Co., a long-standing family business which still operates elsewhere in the area. The building’s spaces are redolent of its manufacturing past and of a period of international trade, when consumer goods were most often marked with the tag ‘Empire Made’. 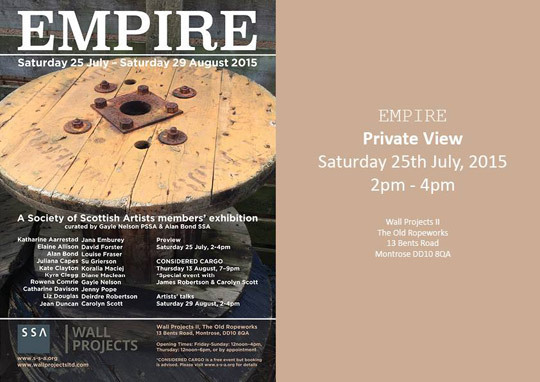 SSA Members were asked to propose existing works or submit proposals for new works on the theme of ‘Empire’. Artists have been encouraged to explore the idea of Empire in its broadest sense, and may make historical or contemporary references to the subject. We imagine the exhibition to represent both big ideas and to draw attention to small details. We imagine it to reflect contrasting views on the benefits and disadvantages of Empire and to consider small scale personal empires as well as geo/political dominance and the practices of global commercial enterprise. Wall Projects was established by Kim Canale eight years ago and the space consists of two modernised gallery areas on an upper level and a raw, post-industrial space on the ground floor, containing vestiges of its former use as a rope manufacturing enterprise. The premises have further rooms and outdoor areas which may inspire site specific concepts.